Vickie, you're outdoing yourself each time! I'll be back to read your full article but in the meantime I clicked on your artwork and it's just spectacular. Festival readers are going to love this. I've always loved Longfellow--and I agree with Evelyn, your artwork is fabulous--it fills my eyes. Evelyn & Beth, thank y'all so much for stopping by and reading and commenting on what I share here. I do enjoy yall's visits. Before working on this particular blogpost, I did not have a clue that there existed a poem that mentioned some connection between great-grandpa Cleeves and Longfellow. When I saw the theme for the month of August would be water, I immediately thought of The Whales of August (luv that movie), and of Peaks Island. 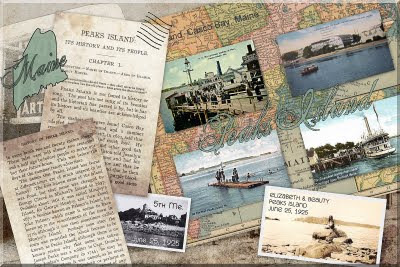 As per my usual tendency to try to genealogize everything I blog about, I knew I had 1920's family photos from Peaks Island to supplement the Peaks postcards. And I knew our family connections to Peaks went all the way back to great-grandpa Cleeves during the 17th century. While reading about Peaks Island, I came across an anonymous quote that I liked, so I Googled it to see who penned those words about "footprints hidden by a brook, but seen on either side." That search led me to Longfellow's poem, "A Gleam of Sunshine." Then I remembered mention of some connection between great-grandpa Cleeves and Longfellow, so I started Googling their names. And that led me to the Longfellow tribute poem that was read on Longfellow's 75th birthday in 1882 -- which alludes to the story that the land of Longfellow's birth at one time belonged to great-grandpa Cleeves. And then I started reading other Longfellow poems and remembering how much I love his work. I had to drag myself back to the 21st century to finish this blogpost, but I have several sites bookmarked for going back and endulging in a little Longfellow reading. Note to self . . . make a trip to Half-Price Books this weekend . . . V. . . .
P.S. to Beth . . . I L-U-V the comment . . . "it fills my eyes" . . . It is now 11:58 pm here in Texas, and I am watching "The Whales of August" on the encore channel! Another amazingly detailed post! I just returned from 3 months in Maine and miss it already. P.s. The lobster men on Peaks Island were in the news last week standing on the pier. Thank you for taking part in the Poetry Challenge!